Vol. 1. No. 1. JANUARY, 1897. PRICE 15 CENTS: $1.50 A YEAR. “With cheerful hop from perch to spray, They sport along the meads; In social bliss together stray, Where love or fancy leads. It has become a universal custom to obtain and preserve the likenesses of one’s friends. Photographs are the most popular form of these likenesses, as they give the true exterior outlines and appearance, (except coloring) of the subjects. But how much more popular and useful does photography become, when it can be used as a means of securing plates from which to print photographs in a regular printing press, and, what is more astonishing and delightful, to produce the real colors of nature as shown in the subject, no matter how brilliant or varied. We quote from the December number of the Ladies’ Home Journal: “An excellent suggestion was recently made by the Department of Agriculture at Washington that the public schools of the country shall have a new holiday, to be known as Bird Day. Three cities have already adopted the suggestion, and it is likely that others will quickly follow. Of course, Bird Day will differ from its successful predecessor, Arbor Day. We can plant trees but not birds. It is suggested that Bird Day take the form of bird exhibitions, of bird exercises, of bird studies—any form of entertainment, in fact, which will bring children closer to their little brethren of the air, and in more intelligent sympathy with their life and ways. There is a wonderful story in bird life, and but few of our children know it. Few of our elders do, for that matter. A whole day of a year can well and profitably be given over to the birds. Than such study, nothing can be more interesting. The cultivation of an intimate acquaintanceship with our feathered friends is a source of genuine pleasure. We are under greater obligations to the birds than we dream of. Without them the world would be more barren than we imagine. Consequently, we have some duties which we owe them. What these duties are only a few of us know or have ever taken the trouble to find out. Our children should not be allowed to grow to maturity without this knowledge. The more they know of the birds the better men and women they will be. We can hardly encourage such studies too much.” Of all animated nature, birds are the most beautiful in coloring, most graceful in form and action, swiftest in motion and most perfect emblems of freedom. They are withal, very intelligent and have many remarkable traits, so that their habits and characteristics make a delightful study for all lovers of nature. In view of the facts, we feel that we are doing a useful work for the young, and one that will be appreciated by progressive parents, in placing within the easy possession of children in the homes these beautiful photographs of birds. The text is prepared with the view of giving the children as clear an idea as possible, of haunts, habits, characteristics and such other information as will lead them to love the birds and delight in their study and acquaintance. Above is the Cover Photo and Preface to a monthly magazine written about Birds. 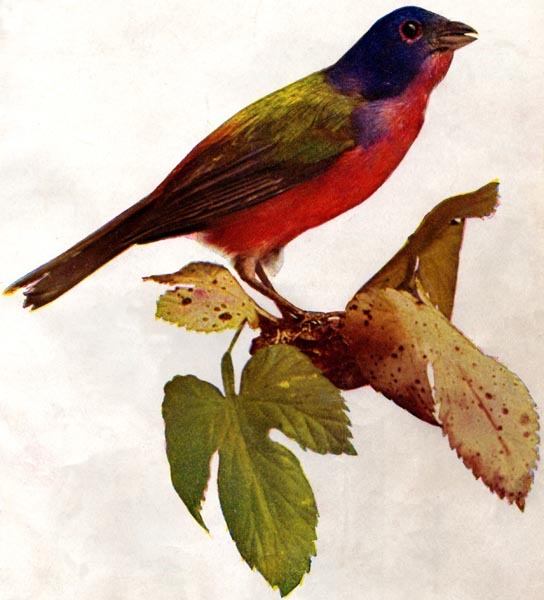 The different birds are illustrated with a lovely Colorful Illustration and then details about the individual bird. Some of the birds have poems and stories also included. 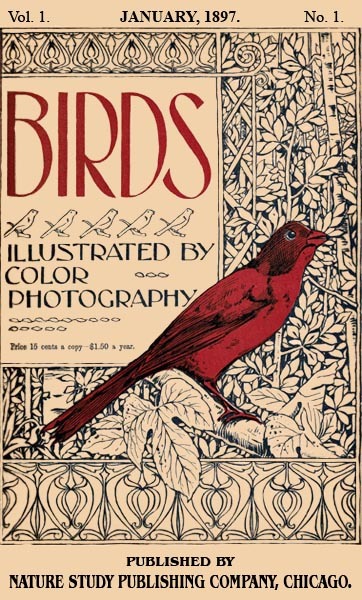 The Birds, Illustrated by Color Photography was begun in January of 1897 and went until at least February 1898. Why produce these pages? For one, they are very interesting and as birdwatchers, reading about the various birds that were so beautifully created, is enjoyable. The writers back in 1897 and 1898 spent many hours preparing this magazine, so why not re-visit their work. Just because time moves on does not mean everything from the past should be forgotten. These will be produced with updates to today and current photos also. Some of the names have been changed since then and that will be shown. Also, current links to more information will be provided, like our Birds of the Bible and Birds of the World, plus others. Some editing will happen, as I have already found one incident to remove because it was offensive to a people group. This book was digitized by the great people at the Project Gutenberg and this is in the Public Domain, including the Illustrations. Most articles have two parts. The first is geared to the reading level for children and the other part for more mature readers. I trust you enjoy reading and learning about the birds.